Sparse matrix–vector multiplication (SpMV) is one of the most indispensable kernels of solving problems in numerous applications, but its performance of SpMV is limited by the need for frequent memory access. Modern processors exploit data-level parallelism to improve the performance using single-instruction multiple data (SIMD). 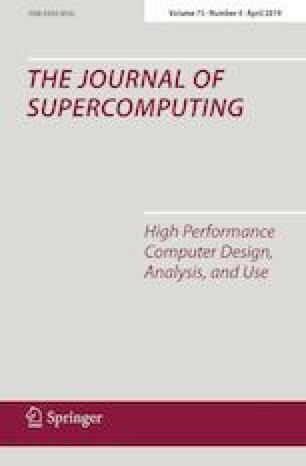 In order to take full advantage of SIMD acceleration technology, a new storage format called Variable Blocked-\(\sigma\)-SIMD Format (VBSF) is proposed in this paper to change the irregular nature of traditional matrix storage formats. This format combines the adjacent nonzero elements into variable size blocks to ensure that SpMV can be computed with SIMD vector units. We compare the VBSF-based SpMV with traditional storage formats using 15 matrices as a benchmark suite on three computing platforms (FT2000, Intel Xeon E5 and Intel Silver) with different SIMD length. For the matrices in the benchmark suite, the VBSF obtains great performance improvement on three platforms, respectively, and it proves to have better storage efficiency compared with other storage formats. This research work was supported in part by the National Key Research and Development Program of China (2017YFB0202104).